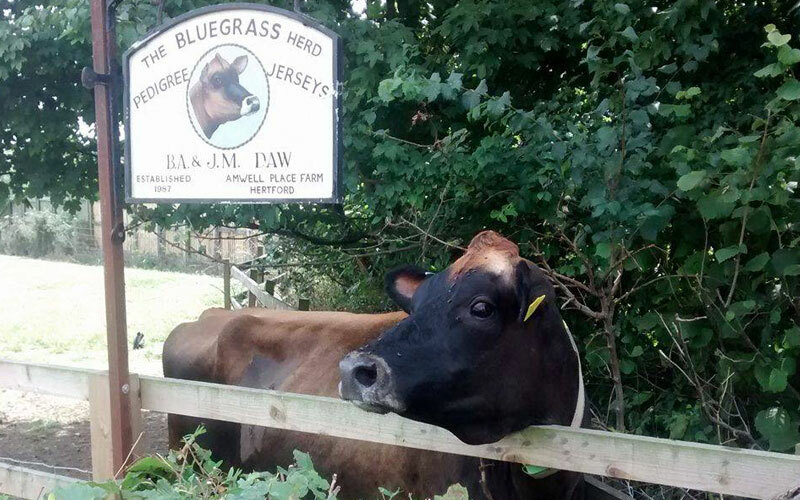 Home to Barry, Jenny and Claire Daw and the Bluegrass and Bluerock Jersey Herd, at Amwell Place Farm. 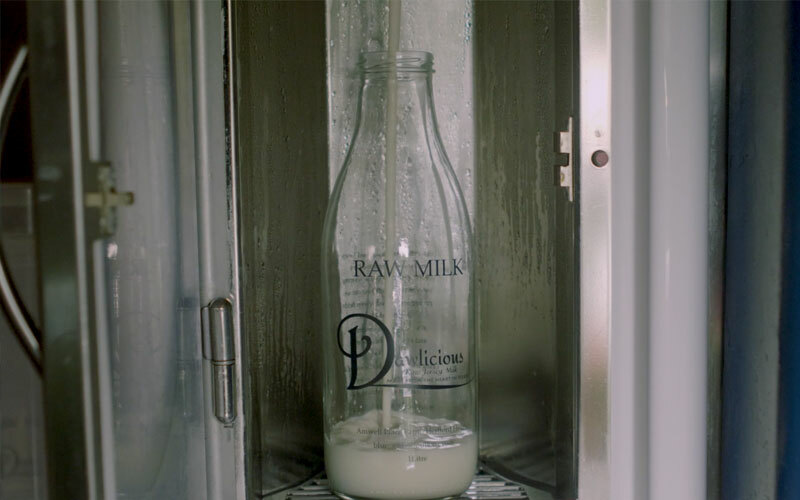 Our raw milk is available to buy from our easy to use vending machine 7 days a week, along with free range eggs and a huge variety of Dawlicious Ice Cream. 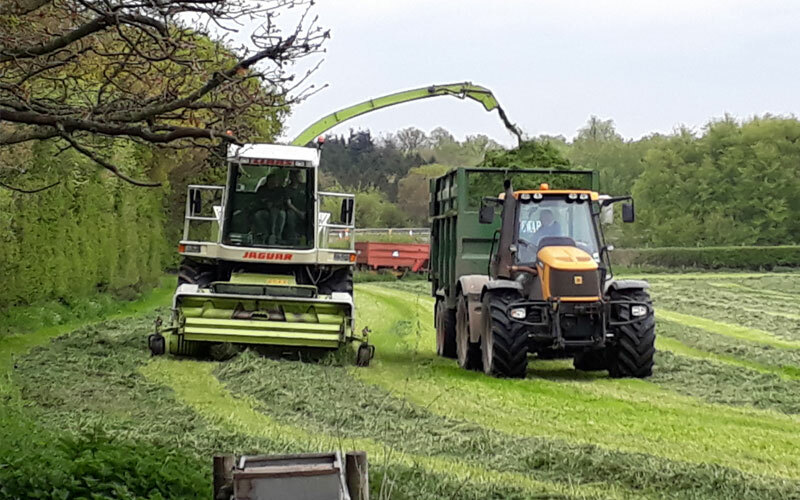 Amwell Place Farm, Downfield Road, Hertford Heath, Herts SG13 7RZ. 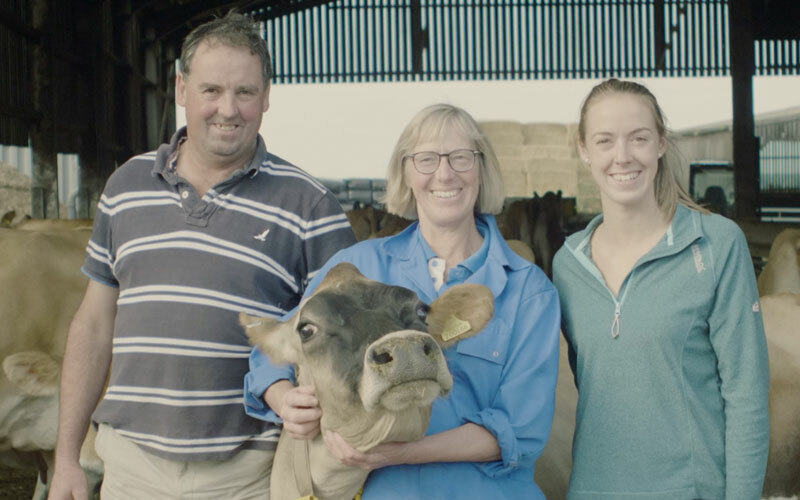 Barry and Jenny Daw have been involved in farming as soon as they could walk, with both their parents working on dairy farms. 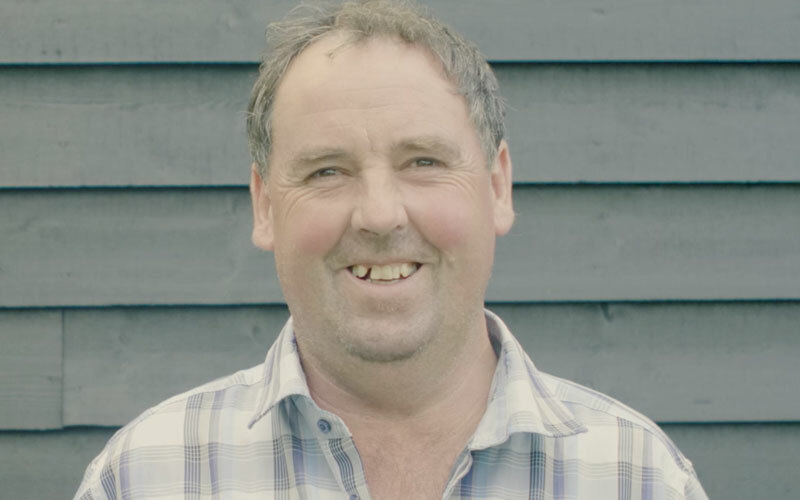 The love for farming is what brought Barry and Jenny together over 25 years ago and from there their passion has grown. 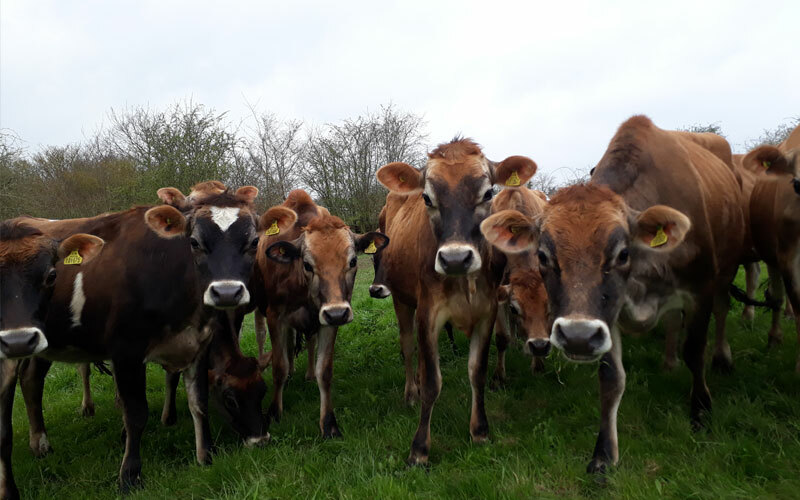 They have been at Amwell Place farm in Hertford Heath since 2002 and have grown the jersey herd to become national award winning cows, gaining red rosettes and championships right across the UK. 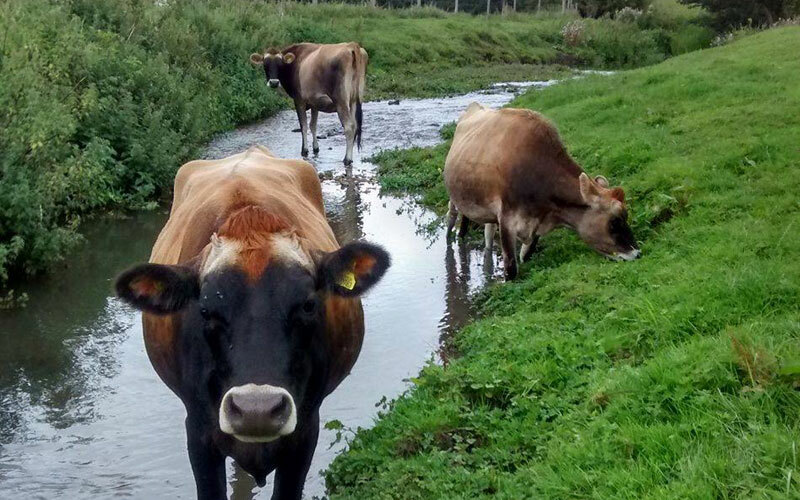 The cows graze the fields in Hertford Heath over 6 months of the year in the spring and summer when the grass is full of nutrients. 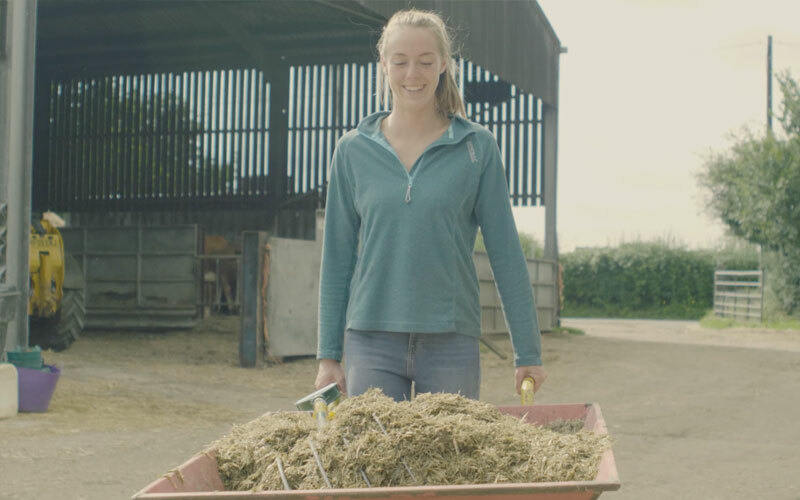 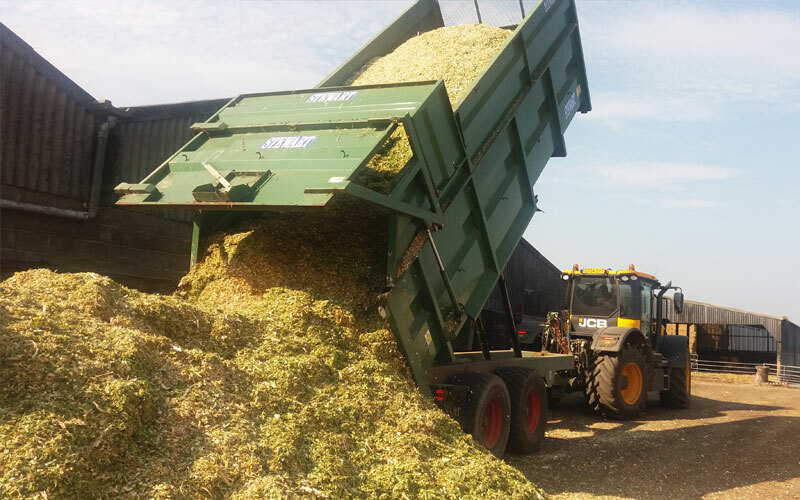 In the autumn and winter the cows are fed a tasty mixture of grass, maize (both grown and harvested on our farm), straw, fodder beet and minerals while relaxing on a straw bedded yard which you can see as you collect your milk from the vending machine. 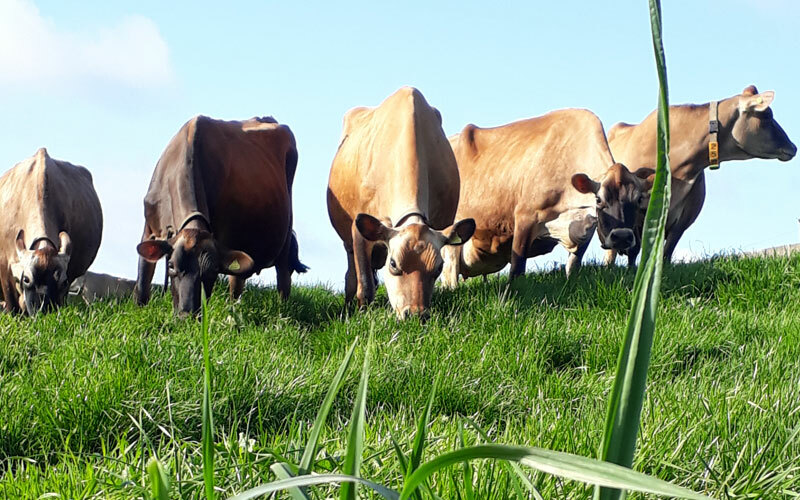 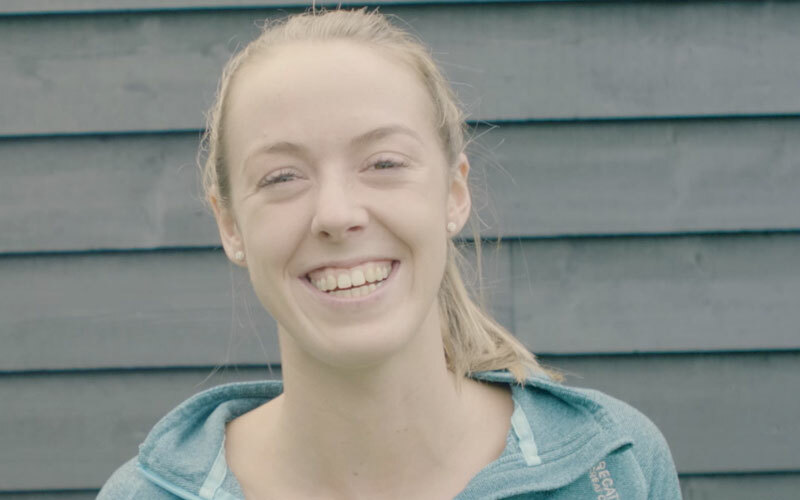 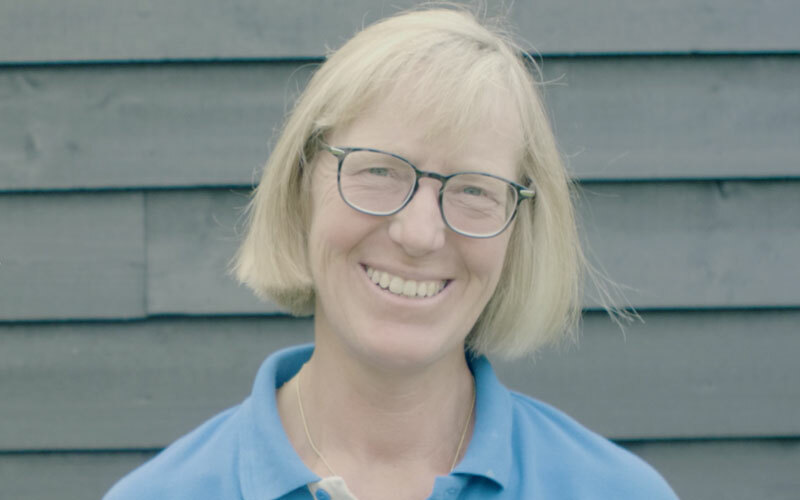 Their passion for their jersey cows has rubbed off on their daughter Claire who started making rich, creamy Ice cream from their cows milk making Dawlicious Ice Cream. 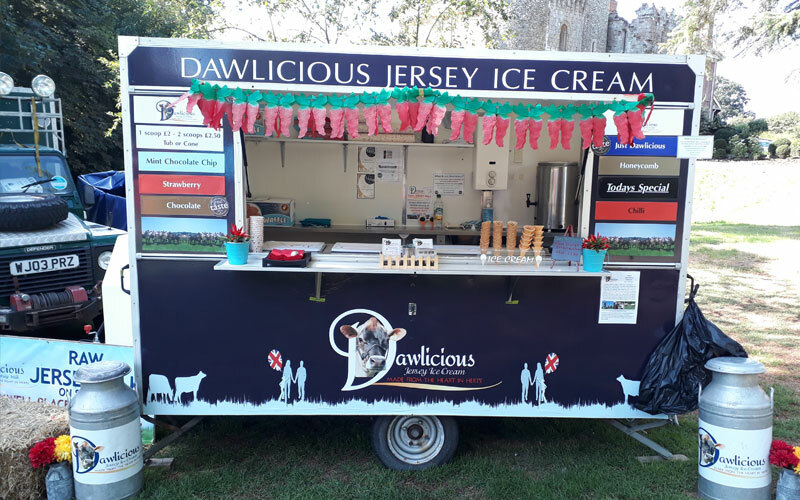 Dawlicious Ice Cream is made on farm by daughter Claire using the milk from their jersey herd. 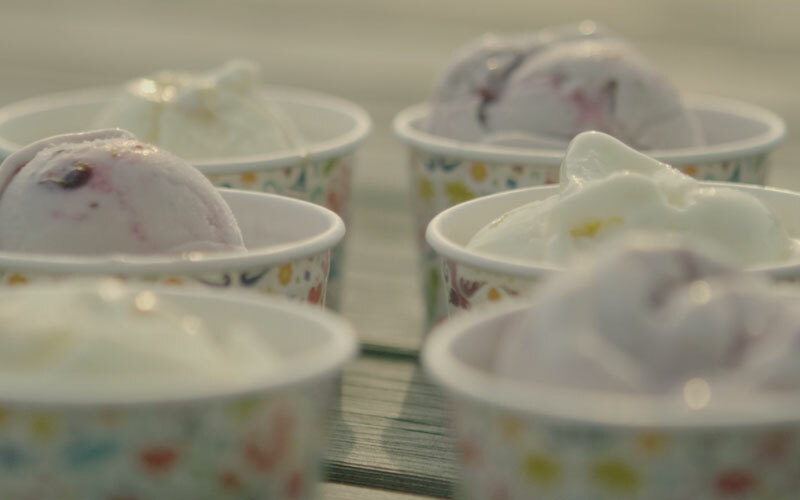 All of the ice cream has 0 food miles going from cow to tub in a matter of meters and hours. 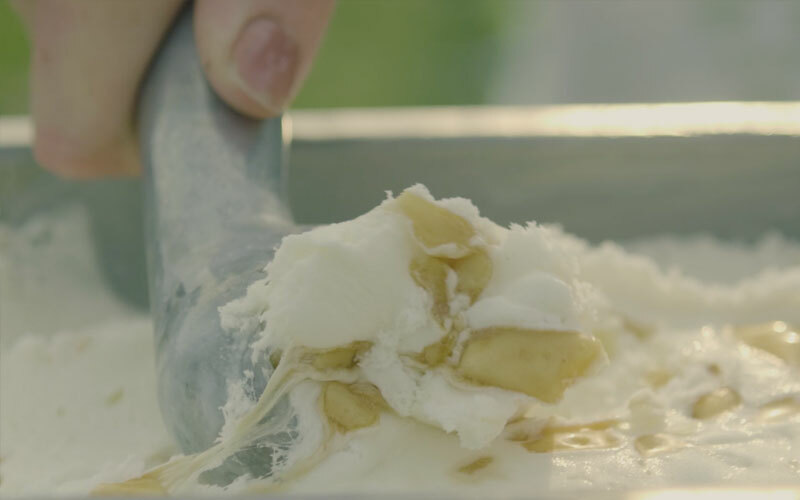 The ice cream is kept as natural as possible using local ingredients where possible e.g. 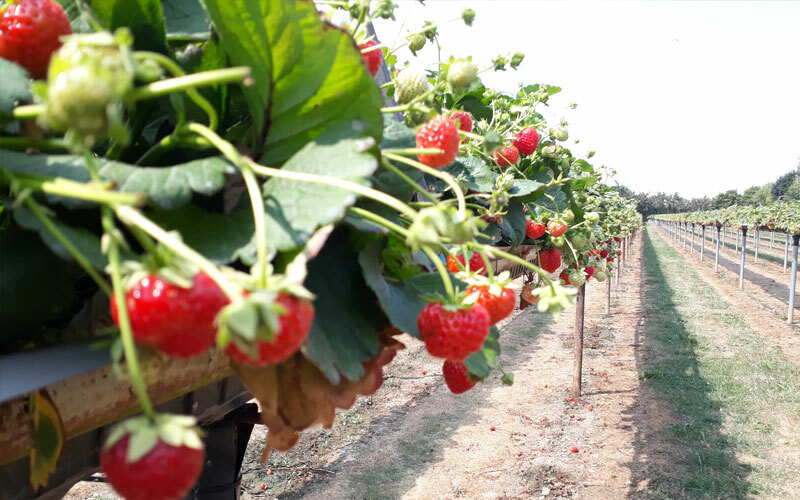 strawberries from Cammas Hall in Hatfield Heath. 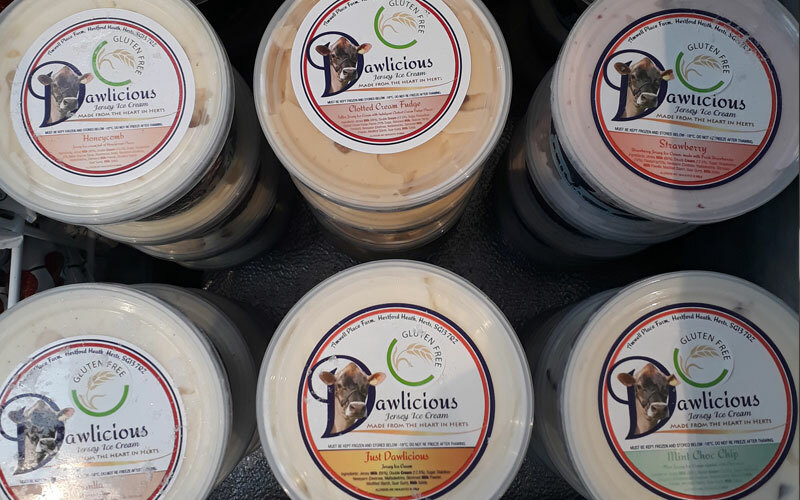 Dawlicious base flavor of Just Dawlicious and Chocolate have both won a ‘great taste awards star 2016’. 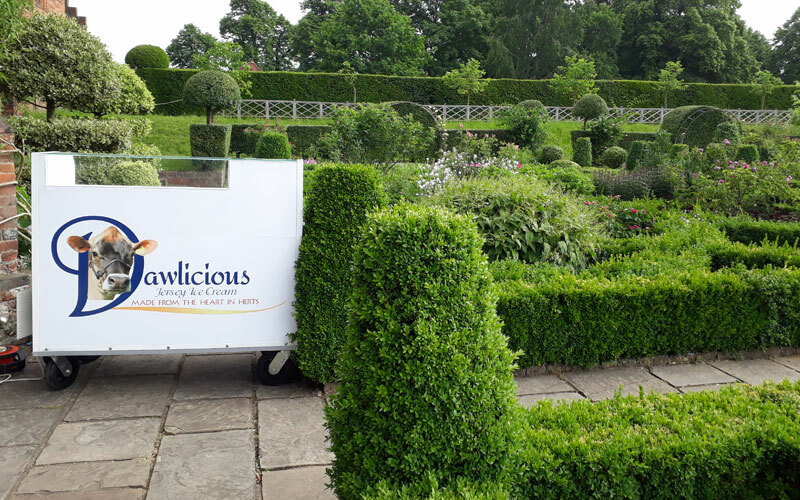 Dawlicious Ice Cream can cater for all your ice cream needs as its available in 500ml tubs, 2 and 4 litre tubs for retail and catering. 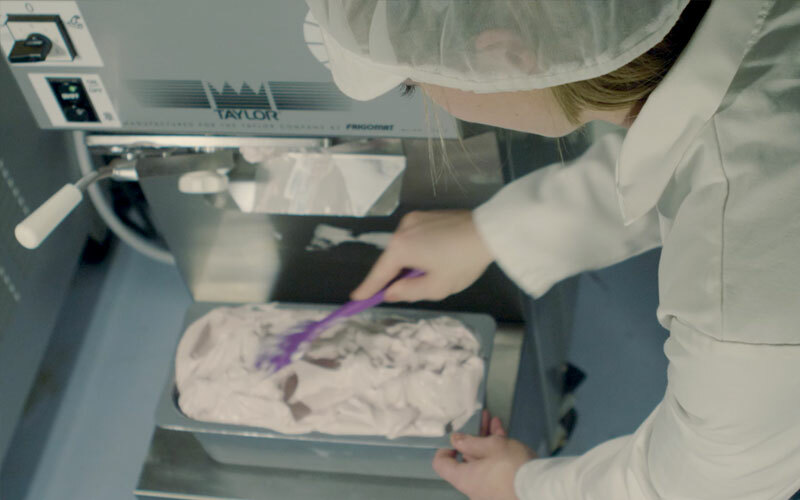 All sizes are available in a growing number of flavours and as the ice cream is made in small batches Claire can create unqiue flavours to suit your need with some previous flavours including Chilli, Pink Peppercorn and Daim Bar. 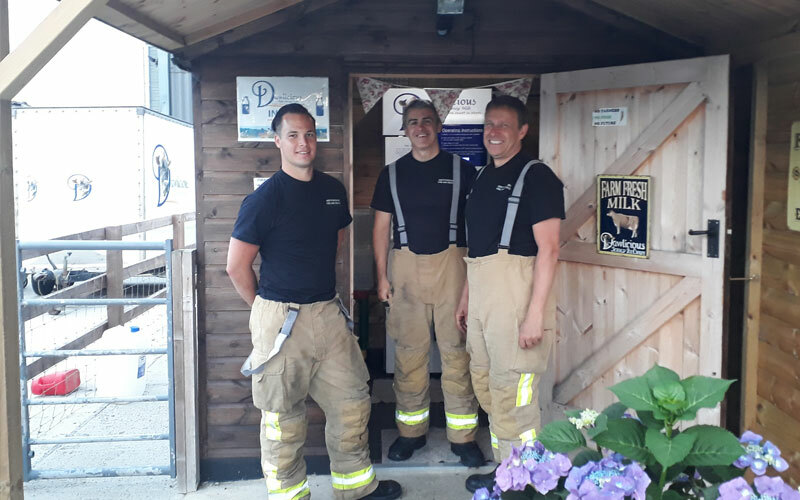 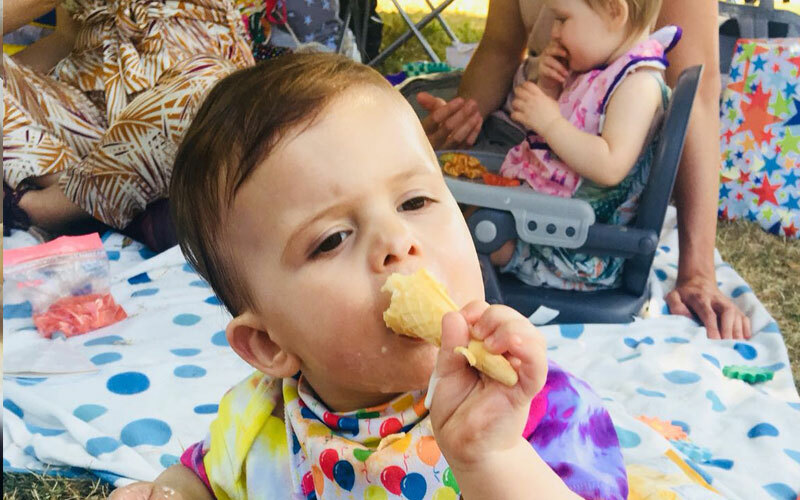 The Ice cream is available to purchase from the farm otherwise Foxholes Farm Shop, Brookmans park Dutch Market Place and Cammas Hall sell 500ml tubs. 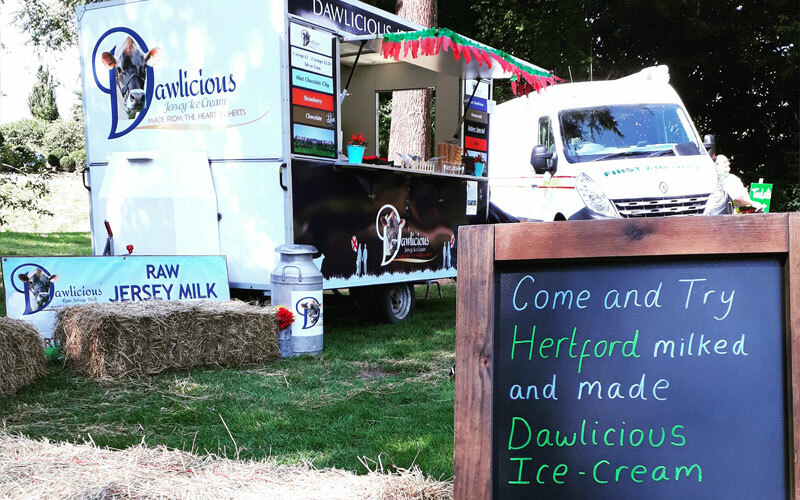 Dawlicious Ice Cream can also cater for any event with a large catering trailer perfect for shows, fetes and festivals and also a small handmade cart which holds 6 flavours to cater for weddings, parties or small functions. 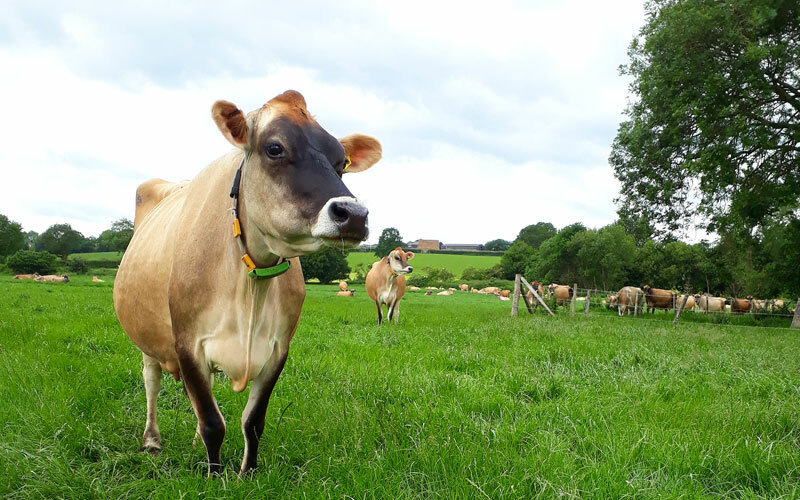 Raw jersey milk is available to buy from Amwell place farm with a vending machine full of rich, creamy raw jersey milk which has 0 food miles and is never older than 24 hours. 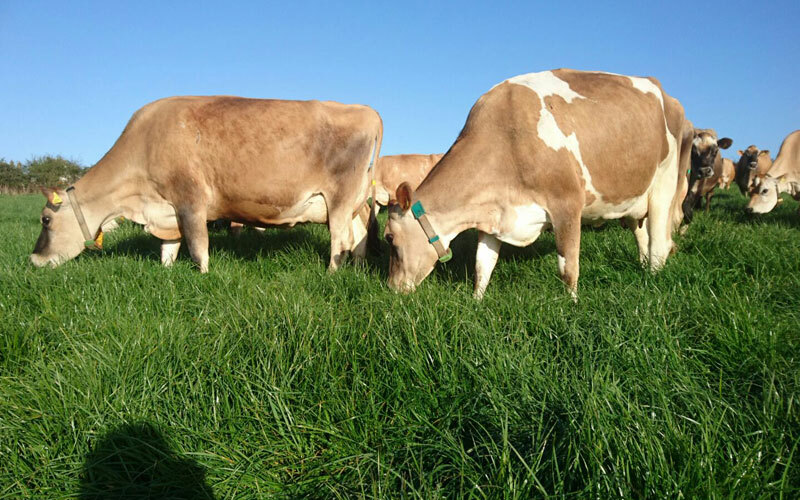 The milk is completely raw so it has not been pasteurized or homogonised. 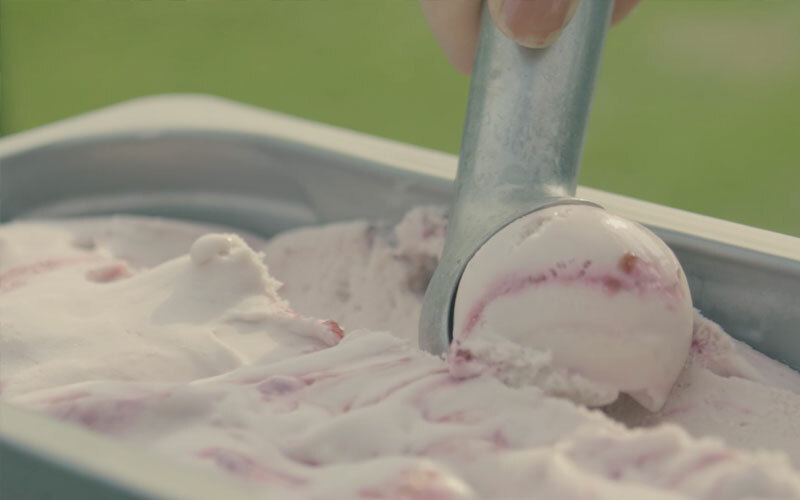 The vending machine is open 7 days a week 7am – 7pm. 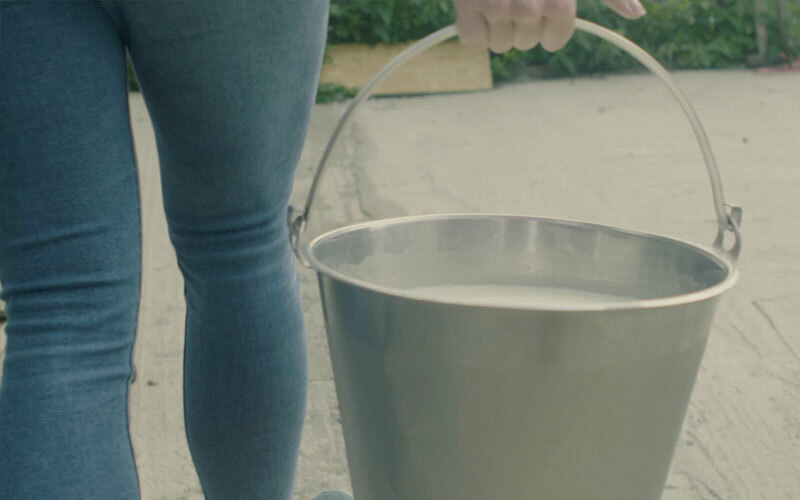 The machine dispenses 1 or 2 litres at a time with larger quantites available to purchase by order. 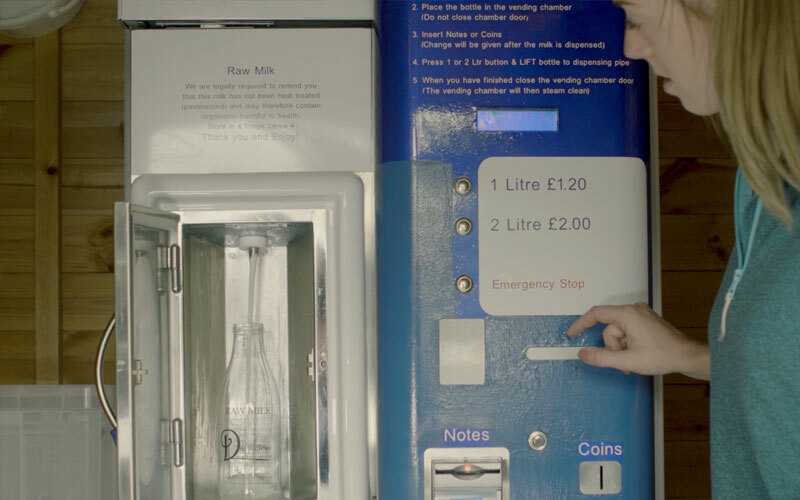 It is very easy and straight forward to use the vending machine with plastic bottles included in the price or glass bottles available to buy on site which you can re use again and again. 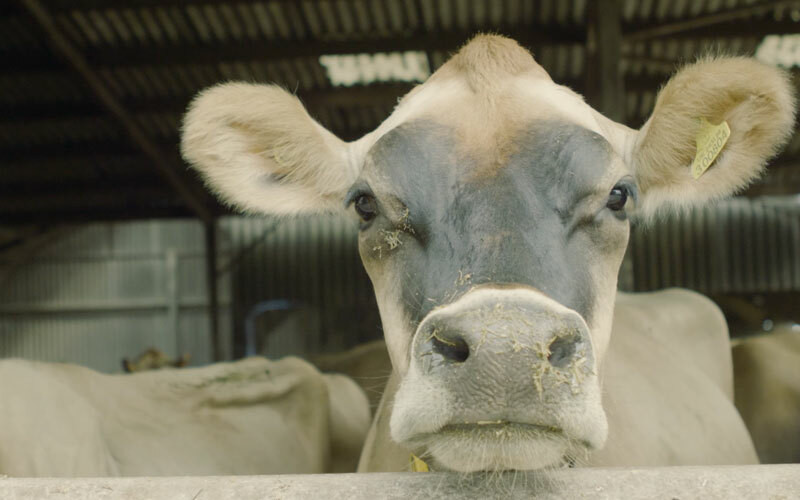 Raw milk is currently unavailable. 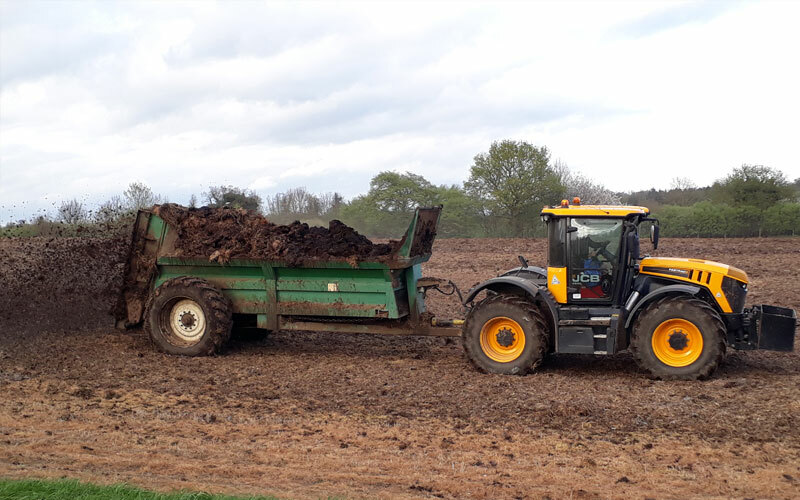 It should be available at the beginning of April, please contact Claire for more details. 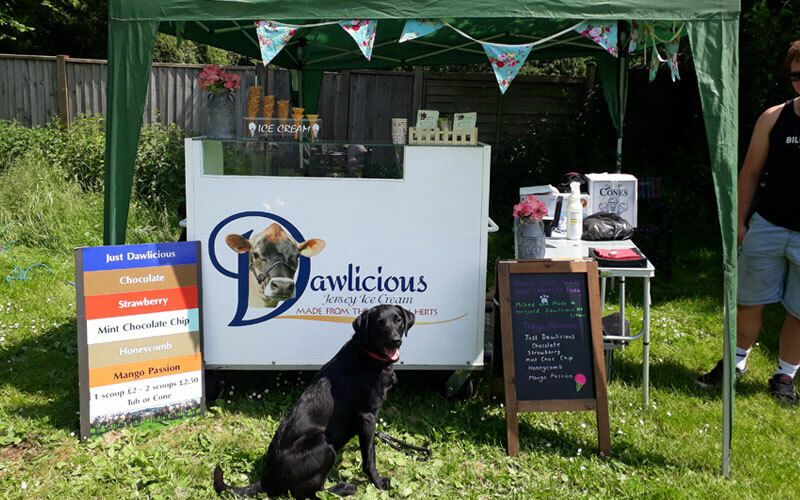 Take a look at all the exciting things we do here at Dawlicious Raw Milk and Dawlicious Ice Cream.